This is an extremely functional 2 bed & 2 baths corner suite spread over 1027 SF at the popular ESPANA developement. Stunning views of water, city & local mountains! S/S appliances, granite countertops & high end finishings throughout. WOW! 1 parking & 1 storage locker! Amenities include one of the largest gyms & pools downtown, party room, theatre & library. Awesome location! 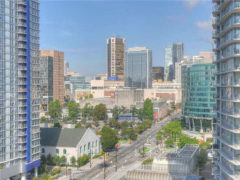 Steps to Rogers Arena, skytrain, T&T Market, Tinseltown and many many wonderful neighborhood cafes, restaurants, art galleries and chic shops.Centrally located to Downtown, Gastown and Chinatown. Minutes from spectacular seawall!